This rare and interesting name is of French origin, probably introduced into England after the Norman Conquest of 1066, and is a variant spelling of the name Habberjam, itself a metonymic occupational name for a maker of 'habergeons', which were sleeveless jackets of mail or scale armour, worn also as a rought garment for penance. 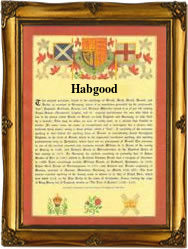 The derivation is from the Old French 'haubergeon', a diminutive of 'hauberc', which has given rise to the Anglicized form Habgood. Among the recordings in London is the marriage of Thomas Habgood and Martha Fenn on March 23rd 1647 at St. Giles, Cripplegate, and the christening of Joseph Habgood on March 24th 1658 at St. Olave, Southwark, and of John Habgood on September 29th 1673 at St. Dunstan's, Stepney.The Coat of Arms most associated with the family has the blazon of a gold shield thereon a blue anchor between three blue fishes naiant, (which would suggest a victory at sea, blue and gold are the French colours). The Crest being a sword and quill in saltire proper and the motto: Marte et arte translating as "By valour and skill". The first recorded spelling of the family name is shown to be that of Matthew de Habercham, which was dated 1269, in the Lancashire Inquisitions, during the reign of King Henry 111, known as 'The Frenchman', 1216-1272. Surnames became necessary when governments introduced personal taxation. In England this was known as Poll Tax. Throughout the centuries, surnames in every country have continued to "develop" often leading to astonishing variants of the original spelling.